The Republic of Liberia was created on the Grain Coast for freed American slaves. In 1822 a settlement was formed near the spot where Monrovia now stands. On 26 July 1847 the state was constituted as the Free and Independent Republic of Liberia. On 12 April 1980 President Tolbert was assassinated and his government overthrown in a coup led by Master-Sergeant Samuel Doe. At the beginning of 1990 rebel forces entered Liberia from the north and fought their way successfully southwards to confront President Doe’s forces in Monrovia. The rebels comprised the National Patriotic Front of Liberia (NPFL) led by Charles Taylor, and the hostile breakaway Independent National Patriotic Front led by Prince Johnson. A peacekeeping force dispatched by the Economic Community of West African States (ECOWAS) disembarked at Monrovia on 25 Aug. 1990. On 9 Sept. President Doe was assassinated by Johnson’s rebels. ECOWAS installed a provisional government led by Amos Sawyer. Charles Taylor declared himself president, as did the former vice-president, Harry Moniba. A succession of ceasefires was negotiated and broken. An ECOWAS-sponsored peace agreement was signed on 17 Aug. 1996 in Abuja, providing for the disarmament of all factions by the end of Jan. 1997 and the election of a president on 31 May 1997. By the end of Jan. 1997 some 20,000 out of approximately 60,000 insurgents had surrendered their arms. It is estimated that up to 200,000 people died in the civil war and up to 1m. were made homeless. Charles Taylor was elected president in July 1997. In Feb. 2002 Taylor declared a state of emergency after an attack by a group of rebels on the town of Kley, where thousands of refugees from Sierra Leone were encamped. In Aug. 2003 the UN called for the immediate deployment of an ECOWAS peacekeeping force, to be replaced by a full UN force on 1 Oct. Nigerian peacekeepers arrived on 4 Aug. 2003. Taylor relinquished power to his vice-president, Moses Blah, and to a transitional government on 11 Aug. In Nov. 2005 Ellen Johnson-Sirleaf won presidential elections to become Africa’s first elected female head of state. In May 2012 Charles Taylor received a 50-year prison sentence for war crimes from the UN-sponsored Special Court for Sierra Leone. Liberia is bounded in the northwest by Sierra Leone, north by Guinea, east by Côte d’Ivoire and southwest by the Atlantic Ocean. The total area is 97,036 sq. km. At the last census, in 2008, the population was 3,476,608; density, 36 per sq. km. The UN gives a projected population for 2020 of 5·10m. Liberia’s population has doubled since the mid-1990s. In 2007, 59·5% of the population lived in urban areas. English is the official language spoken by 20% of the population. The rest belong in the main to three linguistic groups: Mande, West Atlantic and the Kwa. These are in turn subdivided into 16 ethnic groups: Bassa, Bella, Gbandi, Mende, Gio, Dey, Mano, Gola, Kpelle, Kissi, Krahn, Kru, Lorma, Mandingo, Vai and Grebo. The population of Monrovia (the capital) was 970,824 in 2008 including its suburbs. 2008 births, estimate, 145,000; deaths, 40,000. 2008 rates (per 1,000 population), estimate: birth, 38·3; death, 10·5. Annual population growth rate, 2000–08, 3·7%. Life expectancy at birth (2013): 59·6 years for men and 61·5 years for women. Infant mortality in 2010 was at 74 per 1,000 live births. Fertility rate, 2008, 5·9 births per woman. An equatorial climate, with constant high temperatures and plentiful rainfall, although Jan. to May is drier than the rest of the year. Monrovia, Jan. 79°F (26·1°C), July 76°F (24·4°C). Annual rainfall 206" (5,138 mm). A constitution was approved by referendum in July 1984 and came into force on 6 Jan. 1986. Under it the National Assembly consisted of a 26-member Senate and a 64-member House of Representatives. For the elections of 2005 the number of seats in the Senate was increased to 30 and in 2010 a further nine seats were added to the House of Representatives, bringing the total to 73. The executive power of the state is vested in the President, who may serve up to two six-year terms. ‘All hail, Liberia, hail!’; words by President Daniel Warner, tune by O. Luca. In the first round of presidential elections held on 10 Oct. 2017 George Weah of the Coalition for Democratic Change (CDC) received 38·4% of the vote, followed by Joseph Boakai of the Unity Party (UP) with 28·8% and Charles Brumskine of the Liberty Party with 9·6%. There were 17 other candidates. Turnout was 75·2%. With no candidate receiving an absolute majority a run-off had been scheduled to take place on 7 Nov. 2017 but was postponed after Charles Brumskine challenged the outcome. However, the Supreme Court confirmed the result and announced that the election would be rerun on 26 Dec. 2017. Weah won with 61·5% of the vote against Boakai with 38·5%. Turnout in the run-off was 55·8%. In the elections to the House of Representatives also on 10 Oct. 2017 the CDC won 21 seats; UP, 20; the People’s Unification Party, 5; the All Liberia Party, 3; the Liberal Party, 3; the Movement for Democracy and Reconstruction, 2. Six parties won one seat each and independents 13. Elections for half of the seats in the Senate were held on 20 Dec. 2014. As a result the UP held 8 of the 30 seats; the Congress for Democratic Change, 4; the National Patriotic Party, 4; and the Liberty Party, 3. Five parties held one seat each and independents also five with one seat vacant. The elections were scheduled to take place on 14 Oct. 2014 but were postponed by the Electoral Commission owing to an outbreak of Ebola virus disease earlier that year. President: George Weah; b. 1966 (Coalition for Democratic Change; sworn in 22 Jan. 2018). Minister of Agriculture: Mogana S. Flomo, Jr. Commerce and Industry: Wilson K. Tarpeh. Education: Ansu D. Sonii. Finance and Development Planning: Samuel D. Tweh, Jr. Foreign Affairs: Gbehzohngar Findley. Gender, Children and Social Protection (acting): Alice Johnson-Howard. Health and Social Welfare: Dr Williamina Jallah. Information, Culture and Tourism: Eugene Lenn Nagbe. Internal Affairs: Varney A. Sirleaf. Justice and Attorney General: Musa F. Dean. Labour: Moses Y. Kollie. Lands, Mines and Energy: Gesler E. Murray. National Defence: Daniel Dee Ziankahn. Posts and Telecommunications: Cooper W. Kruah. Public Works: Mobutu Nyenpan. Transport: Samuel Wlue. Youth and Sports: D. Zeogar Wilson. Minister of State for Presidential Affairs: Nathaniel McGill. Minister of State Without Portfolio: Trokon A. Kpui. George Weah took office as president on 22 Jan. 2018. Prior to his political career, he was a renowned professional footballer. George Tawlon Manneh Oppong Ousman Weah was born on 1 Oct. 1966 in Grand Kru County, one of Liberia’s most underdeveloped areas. He was schooled in Monrovia and at the age of 15 began playing soccer for the Young Survivors youth club. Weah signed for leading French football club AS Monaco in 1988 and then moved to Paris Saint-Germain four years later. In 1995 he transferred to AC Milan in Italy and helped them win the top Italian league title twice, in 1995 and 1999. In 2000 he played in the English Premier League for both Chelsea and Manchester City before joining Olympique de Marseille of France in 2001. His football career ended in Aug. 2003 after a period with Al-Jazira in the United Arab Emirates. During his career, Weah was named FIFA World Player of the Year in 1995, as well as African Footballer of the Year three times. Heavily involved inhumanitarian work, he became a UNICEF Goodwill Ambassador in April 1997. Liberia’s civil war had ended in 1997, and in 2005 Weah ran unsuccessfully for the state presidency backed by a new political party, the Congress for Democratic Change. In 2011 he graduated in business management from DeVry University in Florida, USA. In the same year, he ran unsuccessfully for the vice-presidency but in 2014 was elected to the Senate for Montserrado County. In the second round of the 2017 national presidential election he defeated Joseph Boakai with more than 61% of the vote. Weah’s presidential victory marked Liberia’s first peaceful democratic transition in over seven decades. He inherited one of the world’s poorest economies, but stated his intention to eradicate corruption, reform the economy, combat illiteracy and improve living conditions. One of his first acts in office was to slash his own salary and benefits by 25%. In June 2003 UN Secretary-General Kofi Annan called for an international peacekeeping force to restore peace after fighting broke out between government forces and Liberians United for Reconciliation and Democracy (LURD). An ECOWAS peacekeeping force of over 3,000 troops was deployed initially, but was replaced by the United Nations Mission in Liberia (UNMIL). UNMIL had 15,000 personnel at its peak but its mission ended in March 2018. 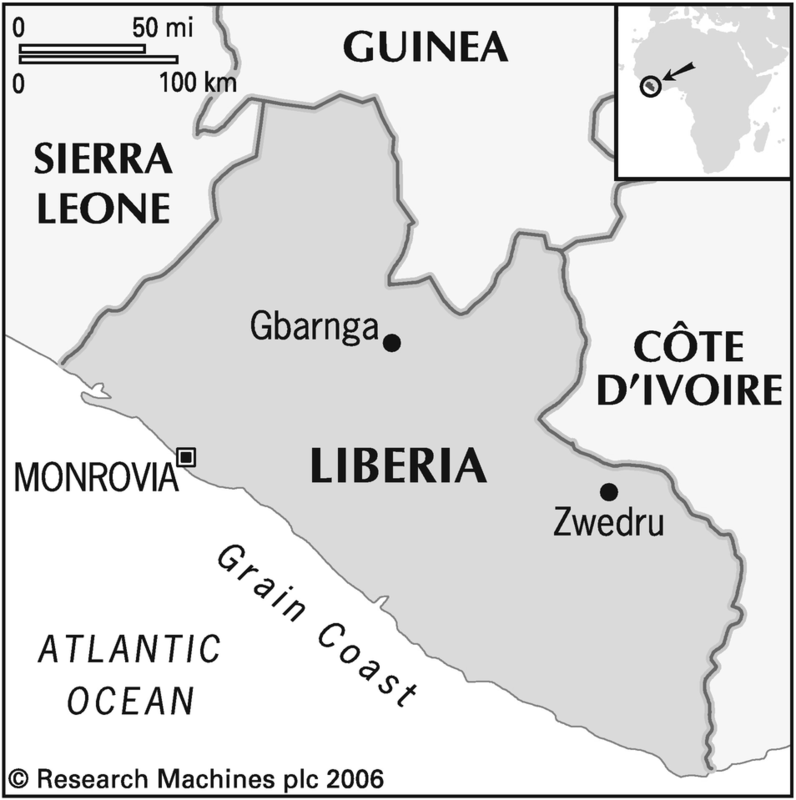 The Armed Forces of Liberia (AFL) were created in 2007 to replace the Liberian Army, which was demobilized in 1999. In 2009 there were approximately 2,100 troops. The AFL became operational in June 2013 when a Liberian platoon was deployed to Mali as part of the African-led International Support Mission in Mali (AFISMA). Defence expenditure totalled US$13m. in 2011 (US$3 per capita), representing 0·8% of GDP. Agriculture accounted for 39% of GDP in 2012, industry 16% and services 45%. Liberia is one of the world’s poorest countries and relies heavily on foreign aid despite possessing rich natural resources. Years of civil war and government mismanagement destroyed much of the economy’s human and physical capital, especially in the capital city of Monrovia. 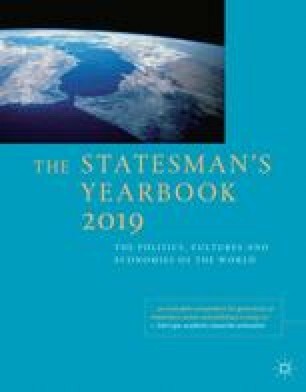 However, with the country’s transition towards democratically-elected government since the early years of the century, its economy has benefited from a period of post-war reconstruction. In 2007, four years after the end of the second civil war, real GDP growth rose to 12·7%, supported by continued recovery in agriculture, mining and services. Growth then averaged 7% per year between 2008 and 2013, driven largely by commodities exports (principally iron ore and rubber). Foreign direct investment (FDI) has been strong in the iron ore and palm oil sectors, while construction activity has experienced rapid growth since the late 2000s. The agricultural and manufacturing sectors, however, have been hampered by low productivity and poor infrastructure. An outbreak of the Ebola virus from March 2014 had a severe impact on economic and social progress, although the disease has been progressively contained. The related cost of healthcare provision strained government finances, while fear of an epidemic led to a slowdown in economic activity. In the short term, the authorities must find the finances to support Ebola-affected households and fund health services. In the medium term, job creation, infrastructure rehabilitation and tackling corruption are key priorities. Slower global demand for commodities and weakened FDI inflows following the Ebola outbreak also pose challenges to the economic outlook. US currency is legal tender. There is a Liberian dollar (LRD), in theory at parity with the US dollar. Between 1993 and March 2000 different notes were in use in government-held Monrovia and the rebel-held country areas, but on 27 March 2000 a set of new notes went into circulation to end the years of trading in dual banknotes. Inflation was 9·9% in 2014 and 7·7% in 2015. Total money supply was L$4,316m. in July 2005 and foreign exchange reserves were US$21m. The fiscal year begins on 1 July. Revenue in 2010–11 was US$334·6m. ; expenditure was US$423·2m. Tax revenue accounted for 80·5% of revenues in 2010–11; current expenditure accounted for 71·3% of expenditures. Real GDP growth was 8·7% in 2013, but only 0·7% in 2014 and then stood at zero in 2015. Total GDP was US$2·1bn. in 2016. The National Bank of Liberia opened on 22 July 1974 to act as a central bank. The Governor of the bank is Milton Weeks. There were only three banks in operation in Jan. 2004. External debt was US$228m. in 2010, representing 28·3% of GNI. Liberia’s carbon dioxide emissions from the consumption of energy were the equivalent of 0·2 tonnes per capita in 2011. Installed capacity in 2011 was estimated at 197,000 kW. Production in 2011 was approximately 353m. kWh. Consumption per capita in 2011 was about 87 kWh. 2010 estimates: gold production 666 kg and diamond production 26,591 carats. In 2007 the agricultural population was approximately 2·31m., of which about 853,000 were economically active. There were an estimated 385,000 ha. of arable land in 2007 and 215,000 ha. of permanent crops. Principal crops (2013 estimates) in 1,000 tonnes: cassava, 529; rice, 270; sugarcane, 265; palm fruit oil, 171; bananas, 131; natural rubber, 75; plantains, 47; palm oil, 42; taro, 28; sweet potatoes, 23. Coffee, cocoa and palm kernels are produced mainly by the traditional agricultural sector. Livestock (2013 estimates): goats, 345,000; pigs, 292,000; sheep, 275,000; cattle, 42,000; chickens, 8m. Livestock products (2013 estimates) in tonnes: meat, 33,000; milk, 800; eggs, 5,000. Forest area was 4·18m. ha. (43% of the land area) in 2015. In 2011, 7·74m. cu. metres of roundwood were cut. There are rubber plantations. Fish landings in 2012 were an estimated 9,500 tonnes, mainly from sea fishing. There are a number of small factories. Production of cement, cigarettes, soft drinks, palm oil and beer are the main industries. In 2010 the labour force was 1,374,000 (52·3% males). Liberia had 30,000 people living in slavery according to the Walk Free Foundation’s 2013 Global Slavery Index. Imports in 2008 were US$865m. and exports US$262m. Main import sources in 2004 were South Korea, 38·1%; Japan, 21·9%; Singapore, 12·6%. Major export destinations in 2004 were the USA, 61·4%; Belgium, 29·5%; China, 5·3%. Main imports are food and live animals, petroleum and petroleum products, and machinery and transport equipment. Main exports are rubber, and logs and timber. The road network totals around 10,000 km, much of it in extremely poor condition. In 2007 there were 7,400 passenger cars in use and 2,800 lorries and vans. There is a total of 490 km single track. A 148-km freight line connects iron mines to Monrovia. There is a line from Bong to Monrovia (78 km). The railways were out of use for many years because of the civil wars but there is now some traffic, both freight and passenger. However, large sections of track have been dismantled. There are ports at Buchanan, Greenville, Harper and Monrovia. Over 4,000 vessels entered Monrovia in 2013. The Liberian government requires only a modest registration fee and an almost nominal annual charge and maintains no control over the operation of ships flying the Liberian flag. In Jan. 2014 there were 3,025 ships of 300 GT or over registered, totalling 128·85m. GT (a figure only exceeded by Panama’s fleet). Of the 3,025 vessels registered, 984 were container ships, 825 oil tankers, 809 bulk carriers, 289 general cargo ships, 115 liquid gas tankers and three passenger ships. In 2009 Liberia had just 2,200 main (fixed) telephone lines, but there were 1,058,000 mobile phone subscribers. No other country had such a high ratio of mobile phone subscriptions to fixed telephone lines in 2009. There were an estimated 5·1 internet users per 1,000 inhabitants in 2009. Out of 178 countries analysed in the 2017 Fragile States Index—a list published jointly by the Fund for Peace and Foreign Policy magazine—Liberia was ranked the 27th most vulnerable to conflict or collapse. The index is based on 12 indicators of state vulnerability across social, political and economic categories. Liberia is governed by a dual system of statutory law. The modern sector is regulated by Anglo-American common law with the indigenous sector following customary law based on unwritten tribal practices. Following a 2003 proposal by UNMIL (United Nations Mission in Liberia), which only left the country in March 2018, a scheme to rebuild the post-civil war justice system was introduced. However, reforms are progressing at a slow rate and the judiciary remains severely dysfunctional. The International Centre for Prison Studies estimated in 2014 that 83·0% of prisoners had yet to receive a trial. In 2015 the World Justice Project Rule of Law Index, which provides data on how the rule of law is experienced by the general public across eight categories, ranked Liberia 92nd of 102 countries for criminal justice and 81st for civil justice. The population in penal institutions in 2012 was 1,930 (46 per 100,000 of national population). Schools are classified as: (1) Public schools, maintained and run by the government; (2) Mission schools, supported by foreign Missions and subsidized by the government, and operated by qualified Missionaries and Liberian teachers; (3) Private schools, maintained by endowments and sometimes subsidized by the government. Adult literacy in 2009 was estimated at 59·1%. In 2008 there were 51 physicians, 978 nursing and midwifery personnel, four dentistry personnel and 269 pharmaceutical personnel. The John F. Kennedy Memorial Hospital in Monrovia is the country’s leading health care institution. The Ebola outbreak of 2014–15 resulted in 4,809 deaths. In Water: At What Cost? The State of the World’s Water 2016, WaterAid reported that 24·4% of the population does not have access to safe water. In 2010 there were an estimated 3·4m. Christians (mainly Protestants) and 480,000 Muslims (mainly Sunnis) according to the Pew Research Center’s Forum on Religion & Public Life. There were seven paid-for daily newspapers in 2008 with a combined circulation of 55,000, plus 24 paid-for non-dailies. Chargé d’Affaires a.i. : Ibrahim Nyei. Chargé d’Affaires a.i. : Jeff Gongoer Dowana.